"When you erupt, girl, make sure it is felt across worlds." Okay okay, I promise to restrain myself and provide a review that isn't just a bunch of tears and squeals (fine, only some of it is comprised of tears and squeals). Before I begin, let me admit that I was dying for this book. I seriously hadn't been so excited for a new release since I was a young girl. The insane ending of what might be my all-time favorite book, A Court of Mist and Fury, left me begging for the third novel. Therefore, my expectations for this third installment in the Court of Thorns and Roses series were sky high. I was honestly concerned by how excited I was. I just wasn't sure if even the incredible Sarah J. Maas could impress me after the perfection of ACOMAF. But guess what? A Court of Wings and Ruin was amazing. Here's the thing about this series: the characters are absolutely stunning. I can think of few other series that have enchanted me as much with their cast. Rhysand, Feyre, Cassian, Azriel, Mor, Elain, Nesta... the list goes on, and I love each and every one of them with all of their immaculately crafted strengths and faults. I'm pretty sure Maas could write an entire 700 page novel about the Court of Dreams going grocery shopping and I'd still end up rating it five stars. Her character development is just that perfect. Obviously, this is a fantasy series, and Maas really showcases her skills as a world builder in this third book. 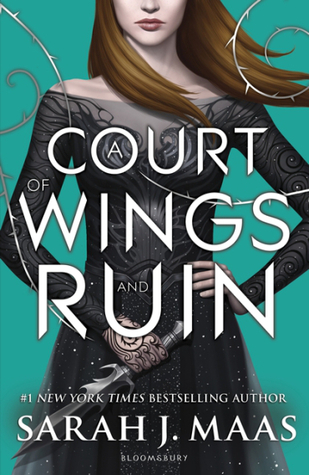 She adds on to the imaginative world she spun in ACOMAF, and she continues to surprise readers with new mythical beings and gorgeously depicted courts. I'm sure I'm not the only reader internally pleading with the universe to let me exist in the world Maas has so lovingly created. We all expected an epic battle, and Maas doesn't just deliver: she brings her A game. I'm talking Return of the King type epic. I seriously thought I might have a heart attack from the stress and sheer intensity of it all. I won't spoil anything for you guys, but like, damn. I was literally breathing hard after reading the most intense chapters. Sure, I really enjoyed the first 500 pages or so of the novel, but the last 200 pages really took my breath away. So, here's the big question: Is this the last ACOTAR novel? Well, Maas has admitted that "there are more tales to be told in the land of Prythian," but that's an extremely vague answer. I will say that this book wraps up the Feyre and Rhysand's story quite beautifully, and as much as I adore the series, I would be happy if this were the ending simply because it is so well-done. Then again, if Maas decides to bless us all with more stories of the Court of Dreams, I won't complain. And by "won't complain," I mean I'll pre-order the book as soon as humanly possible. There are definitely still some loose ends that she could tie up, and my guess is that Maas will do so in follow-up novels that might not feature Feyre as the main character. If you can't tell by the amount of gushing praise in this review, I was not disappointed by this follow-up novel. I laughed, cried, and experienced all the wonders of Prythian once again, and I'm eternally grateful to Maas for creating such a magnificent series.